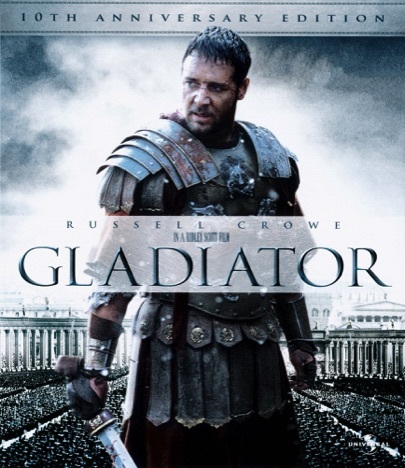 In Gladiator, victorious general Maximus Decimus Meridias has been named keeper of Rome and its empire by dying emperor Marcus Aurelius, so that rule might pass from the Caesars back to the people and Senate. Marcus' neglected and power-hungry son, Commodus, has other ideas, however. Escaping an ordered execution, Maximus hurries back to his home in Spain, too late to save his wife and son from the same order. Taken into slavery and trained as a gladiator by Proximo, Maximus lives only that he might someday take his revenge and fulfill the dying wish of his emperor. The time soon comes when Proximo's troupe is called to Rome to participate in a marathon of gladiator games held at the behest of the new emperor, Commodus. Once in Rome, Maximus wastes no time in making his presence known, and is soon involved in a plot to overthrow the emperor with Lucilla, Commodus' sister, after whom he lusts, and also the widowed mother of Lucius, heir to the empire after his uncle, and democratic-minded senator, Gracchus.